In 2013, after fourteen years of marriage, high profile supervillains/married couple Wendi Deng and Rupert Murdoch went their separate ways. Since then, these two morally bankrupt (but financially rich!) trash goblins have (reportedly) settled down with new romantic partners. So who rebounded best? 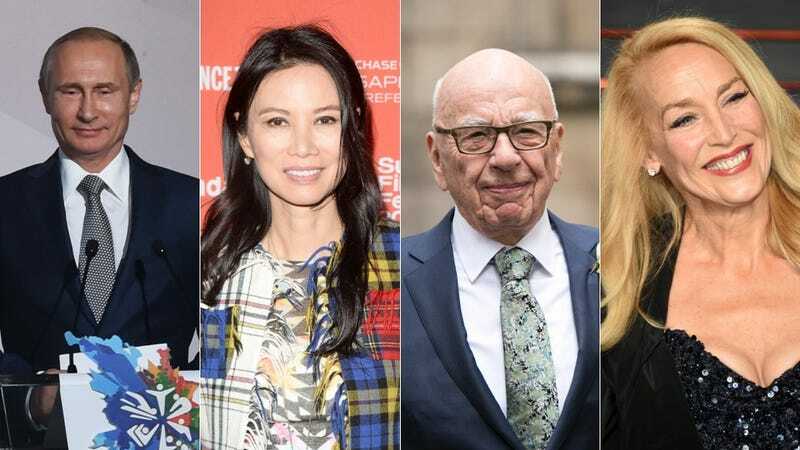 And speaking of SERIOUS, Deng’s ex Ruport Murdoch wed Jerry Hall, former partner to Mick Jagger, this year after a very brief engagement. So we all know who lost the Deng/Murdoch breakup (it’s us, we’re the losers) and now we must decide who won. If you don’t want to vote, I’m sorry. This is your punishment for being alive at this terrible point in time. The case for Rupert Murdoch: Jerry Hall is a former supermodel and is very beautiful. She’s had four children with Mick Jagger and will likely not have anymore kids of her own, meaning no new offspring will be entitled to Murdoch’s money—not even when he dies surrounded by his towering riches and calling out for “Rosebud.” Hall also had a VH1 reality show called Kept, which—obviously—was very good. The case against Rupert Murdoch: Jerry can be a lot of things, but she will never achieve the terrifying beauty of Wendi. The case for Wendi Deng: Sure, she was divorced by a hideous megalomaniac whose conservative rhetoric has left an irreversible blemish on the western world, but she’s traded in for a hideous oligarch who runs a country of 143.5 million people with a (post) iron (curtain) fist. Honestly, what’s the oppressive anti-progressive propaganda of Murdoch’s Fox News compared to Putin’s outlawing of “promoting” of homosexuality and his imprisonment of people who speak out against the government? The case against Wendi Deng: Well, she was divorced by a hideous megalomaniac whose conservative rhetoric has left an irreversible blemish on the western world and traded in for a hideous oligarch who runs a country of 143.5 million people with a (post) iron (curtain) fist.